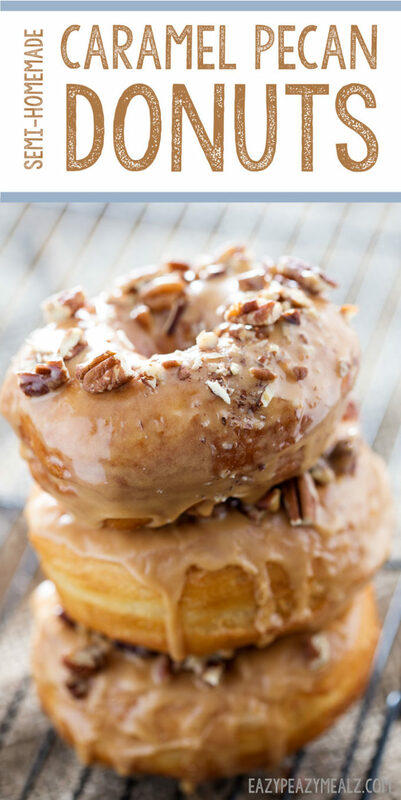 Semi-homemade donuts with a rich caramel glaze, and toasted pecans. You will love how easy and delicious these donuts are! You only need a few ingredients. One of my absolute favorite parts of the holidays are the treats. But we all know how busy it can get, and how making things from scratch is sometimes asking a lot. Every year during the holiday season I make homemade donuts with my kids. It is a tradition we look forward to all year long. We usually start with a basic donut base, and each kid gets to create their own glaze flavor. Sometimes it is cookie butter, sometimes it is lemon, sometimes it is plain glaze with lots of sprinkles. Each kid gets to take a turn coming into the kitchen, frying up their personal donut, and then glazing and topping as they see fit. We make a huge mess, but tons of fun memories. Anyway, this year I needed to simplify things. My husband just started a new job, and is NEVER home, I am working like a crazy person, plus there are always more demands on my time then hours in the day. I am sure so many of you can relate. And so I decided to make my life easier by starting with Pillsbury Grands biscuits as my donut base. It was so much easier than making donuts from scratch, and it tasted amazing! I had NO complaints. Just look at how fluffy and beautiful these simple donuts turned out! When each of my kids took their turn, all they had to do was select a biscuit, poke a hole in the center, either with their fingers or a straw, and place the dough into a vat of hot frying oil. Of course, the hot fryer oil part required some adult assistance to avoid burns. I used a fryer, but you could heat oil up on your stove top in a deep skillet, just be sure to heat to around 375 degrees, and try to keep the heat consistent. Then fry the dough. It will turn golden brown, and taste as good as it looks! For us, it took about a minute per side, but depending on how hot your oil is, and how consistent your heat is, you may need to adjust the cooking time. Basically you want it to be golden brown. If the oil is too hot, the outside will brown too quickly, and the center will be gooey. If this occurs, turn your heat down and wait before cooking the rest of your donuts. Once your donuts are cooked, you glaze them. I usually whip the glaze together during the minute they are cooking since it is just that simple. That way you can pull the donuts out of the oil, glaze while they are still hot, then top them. You could make a fancy glaze, but because we are celebrating our family winter traditions and enjoying the holidays, spending a long time making a glaze made no sense. I just whisked together a premade caramel sauce (dulce de leche), some confectioner’s sugar, and heavy cream. It worked perfectly, and was really easy to adjust the flavor. Then I added tasty toasted pecans that I chopped into smaller pieces. Do yourself a huge favor and get a can (or two or three) of the Pillsbury Grands! and make these donuts. It literally only takes a few minutes, and is so much fun. I just picked up several cans while I was at Walmart finishing up some holiday shopping. I bought the Southern Homestyle for these donuts, but any of the varieties will work. And then you get these! Stir together confectioner's sugar, caramel, and whipping cream until smooth. Taste and adjust to your preference. Poke a hole in the center of a biscuit, and stretch the dough to form a donut shape, leave a big hole, it will puff up and close in. Set on a cooling rack with paper towels under it to let any excess oil drip off. For tons of easy ideas for using Pillsbury to make your holidays taste better, check out this Pillsbury at Walmart page with recipes and ideas from monkey breads, to crescent rings. You are sure to find something you will like. I know I can’t wait to try a few of the recipes I found.